Nice second floor, 3 bedroom plus loft 2 bath condominium in town near the Sierra Star Golf Course and the Free Green Line Shuttle route to the Eagle Lodge Express Ski Lift Area in Mammoth Lakes. The Unit Sleeps up to 8. The Master bedroom has 1 Queen. The Second bedroom has 1 Queen. The Loft bedroom has 2 Twins and the Loft has 2 Full size Futons. The unit has 5 flat screen TV's. Free Wifi. Fully equipped kitchen. Gas Fireplace in Living room. There are two outside parking spaces available - parking passes required. There is a Jacuzzi available in the common area. A lost spa key results in a $100 charge. TOT LICENSE #3390-HER207. Very nice, clean and comfortable condo. Conveniently located near town and Eagle Lodge. Wonderful location and very hospitable hosts! Extremely convenient for a weekend of skiing at Mammoth. Good spot a lot of beds for a boys trip. Great place for great value! The owners were helpful in answering questions. The place was slightly difficult to find at night when we arrived, but it perfectly fit our group and the beds were very comfortable!! This property was a great location for a group of us to stay in over New Years. We were able to walk from the house to the Village in about 10 minutes which was so helpful since we had a larger group of people. 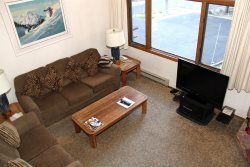 Overall everything ran very smoothly and I would definitely recommend this property to others looking to stay in Mammoth! This place is exactly as described and shown in pictures. It is perfect for a family / group trip because there is so much space! It was also very clean and had everything we needed, including cooking tools. The check-in process was fast and easy. I would definitely stay here again and highly recommend it to others.